By Donagh Corby | April 26, 2017. 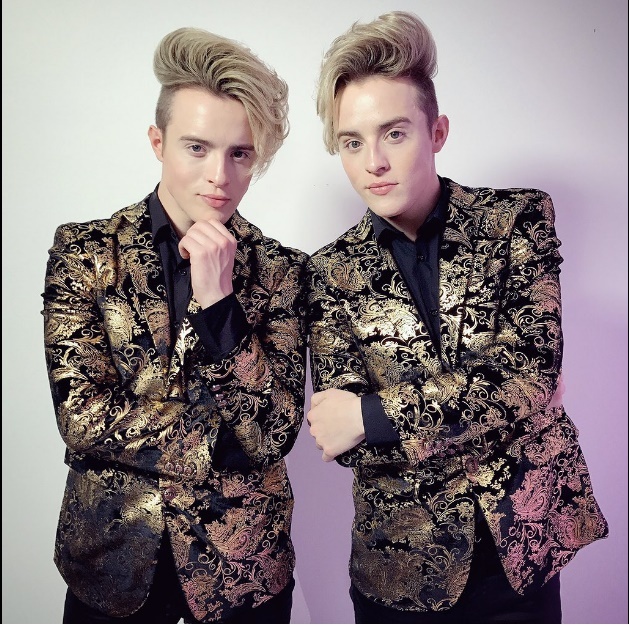 Dublin twins Jedward are constantly fighting the battle for relevancy that comes in the time after an X-Factor act’s fifteen minutes of fame come to an end. The difference for the Grimes brothers? They’re winning. Not nominated for an award, they arrive in style on the VIP Style Awards red carpet in the Marker Hotel. Donning matching black and gold suits and a slight variation on their trademark quiff, fans, journalists and fellow celebs never cease to be amazed. “We’re happy that we’re never nominated, because we don’t need the recognition,” they joke as fans bombard them for selfies and autographs. As one voice bleeds into another, they admit that their recent ‘serious side’ that saw the light in last year’s incarnation of Celebrity Big Brother and the massively successful TV3 documentary series Living with Lucy is something they’ve always been eager to push to the forefront. “We always have [tried to show a serious side]. Our fans always know every side to us, but it takes time for the mainstream public to embrace every side to you. Their appearance in Celebrity Big Brother 2011 drew massive ratings, and a third place finish for the boys. Audiences loved their hijinks so much that this year, they were asked to return to the house for Celebrity Big Brother All-Stars, where they went one better finishing second to Coleen Nolan. Fans of the show were treated to a very different Jedward than the one they saw 6 years prior. “What was different about Big Brother this time around was that there were a lot of toxic people in there with us. They tried to control me and Edward and when toxic people can’t control you, they try to turn everyone else against you, and that’s what they did.” Edward then adds “It was cool though, because everyone saw it at home, so I feel like people watching could relate to it, and what it’s like being in our shoes. One thing you notice when meeting the boys is their unique relationship with their fans. It’s more like a family reunion than a meet-and-greet. “What we think is cool is that us and our fans have been doing our thing for like the last eight years… They’re like our friends.